Proper transportation process such as using the right size of transportation vehicles, loading correctly, securing and positioning equipment minimizes issues that lowers your productivity. Here are the directions on how to load a wheel loader for safe transit. The first step in loading a wheel loader is to select the right trailer. You should consider a trailer that has adequate size and capacity to accommodate the size of the machines and all the attachments of the wheel loader. If you are transporting larger wheel loaders, you will need RGN trailers for safe transportation. 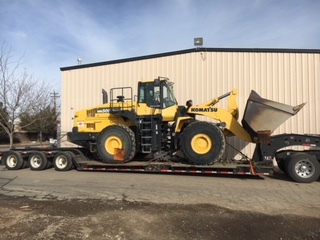 For the smaller wheel loader, step deck trailers or hotshot trailers are the best vehicles for transportation while compact wheel loaders can be shipped quickly and safely with flatbed trailers.Just ask your agent so you can get the right vehicle before you start your journey. Make sure the ramps designs can handle the weight of your wheel loader. If necessary, add some blocking under the ramp for support. Make sure the equipment and the ramp are free of debris, mud or grease that can cause the wheel loader to slide. With the heaviest head of the wheel loader, travel up the ramp while you are loading the loader onto the trailer. Run the engine of the loader at the lowest speed setting and travel at the slowest speed possible while loading the equipment. Make sure that the weight of the wheel loader is evenly distributed on the vehicle to avoid pull and tire wear during transportation. The best way to ensure the weight balance is to check the suspension of the transportation equipment and make sure it is balanced. Lower the attachment or the bucket to the floor, stop the engine and disconnect the battery switch to the off position. Before any transportation starts, ensure all the doors and covers are locked, and wheel loaders with articulation points, hinge or pivots have articulated lock frame to prevent any articulation during transit. Place chocks, cradles, and wedges in front of wheels to prevent any shifting or rolling during transportation. Install all tie downs in front and rear tie down positions. Always use recommended secure and connection points to maximize effectiveness and minimize damage during transportation. Inspect tie-down equipment and tie-down points used to secure the machine. Make sure all connection points and pins are secure, and the hooks are functional. Verify the wheel loader’s tire pressure before loading to avoid loosening of tie-downs, Refer to the owner’s manual for proper tire pounds. Securing the wheel loaders accessories and attachments is essential. The enclosures should be secured to the wheel loader if possible. If not possible, set the attachments on the trailer on an orientation that can easily be contained by chains. Make sure you secure the buckets the transportation equipment. If the loader is equipped with hydraulic attachments, ensure the hoses orientation does not interfere with the machine on the trailer. All horses should lie underneath the device connected in a manner that they could become disengaged. Ensure you secure all the hoses per the owner’s manual before you start transportation.